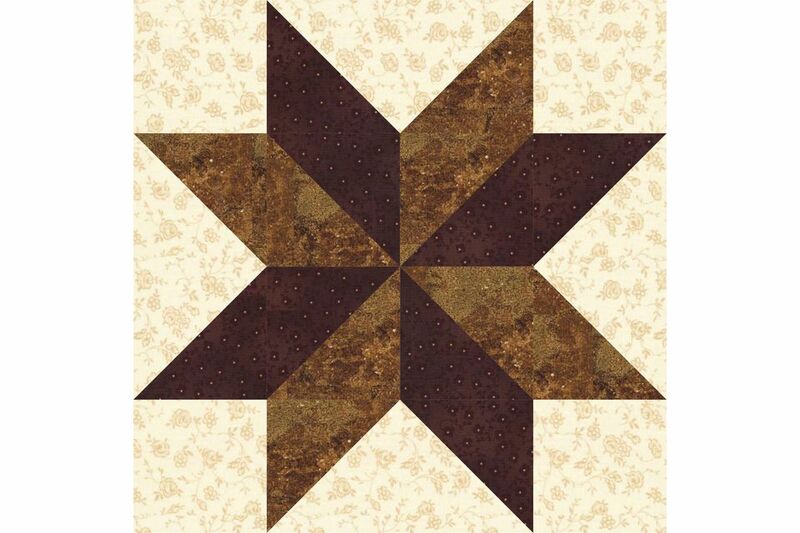 Sarah's Choice is a quilt block pattern that combines the look of a star and a pinwheel. Choose two fabrics of different colors, especially if they contrast, and a pinwheel will emerge. Sew with just one fabric to make the quilt block look more like a star. It's easy to use a couple of quick-piecing techniques to assemble a Sarah's Choice quilt block. Quick-pieced half-square triangle units are perfect for the block's center and quick flying geese units continue the block's spin in the outer rows. Additional half-square triangle units can be used instead of flying geese in the quilt block's outer rows. The difference? A vertical seam will be visible between those units, taking away some of the design's fluidity. That type of look might be perfect if you'd like to make a scrap quilt. You'll find examples of a horizontal quilt layout and an on-point layout below. Consider sewing blocks of different sizes together create a quilt. For instance, a group of four 6" quilt blocks, when sewn together into a square, will match-up to one 12" Sarah's Choice quilt block. Gather the two larger dark brown squares (with dimensions cut in eighths of an inch) and the two medium brown squares of the same size. Use the quick pieced half square triangle method to sew a dark brown square to a medium brown square twice diagonally. Press as-is to set the seams. Cut the pair apart as explained and press seams towards the darker halves of units to create two half-square triangle units. Repeat to create two more units. Gather the four light background rectangles and the remaining dark brown and medium brown squares (the dimension of squares should match the width of your rectangles' short side). Use the quick pieced flying geese method to create four flying geese for the outer rows of your quilt block. Refer to the illustration, taking care to orient the squares as shown to end up with a unit with a dark triangle on one end and a medium triangle on the other end. Arrange the pieced units and four background squares into three rows as shown. Sew components of each row together. Press seam allowances in the top and bottom rows towards the corner squares. Press seam allowances in the middle row towards the center unit. Sew the rows together, matching seams carefully. Your quilt block should be 1/2-inch taller and wider than its finished size. Here's an example of sixteen Sarah's Choice quilt blocks sewn into a horizontal arrangement. The blocks are separated by sashing with cornerstones and surrounded by a border that repeats the brown fabric used in quilt blocks. If you prefer, you could use a border with corner squares or replace corner squares with quilt blocks that match the width of your borders. Here, nine Sarah's Choice quilt blocks are placed on point and separated with plain squares (setting squares) sashing and cornerstones. The dark brown used in blocks is repeated in the sashing and outer border. Although the corner triangles look very much the side setting triangles, they are cut in very different ways to add strength to the outer edges of the quilt.